In this study, we aimed at mapping the trend and impact of mathematics research originated from Association of Southeast Asian Nations (ASEAN) countries by using a scientometric approach. We extracted the Web of Science’s article-level data of all publications concerning mathematics research during the period of 2006–2015 for ASEAN countries. The impact of research was assessed in terms of citation, and the pattern of international collaboration was mapped by the presence of coauthorship and international affiliations. During the coverage period, ASEAN countries had published 9,890 papers in mathematics, accounting for 3.8% of total ISI-indexed publications from the region. Almost 95% of the mathematics publication was from Singapore (4,107 papers), Vietnam (2,046), Malaysia (1,927), and Thailand (1,317). 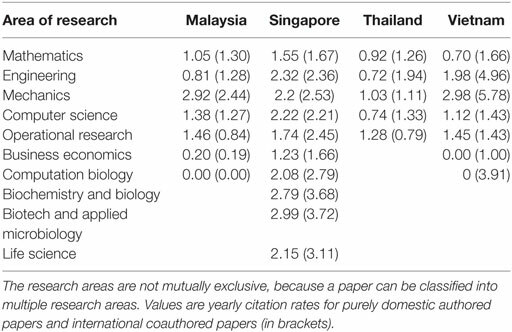 Approximately 54% of mathematics papers from ASEAN countries had international coauthorship, and these papers had greater yearly citation rate than those without international collaboration. With the exception of Singapore, the citation rate for other ASEAN countries was below the world average by 8–30%. The most important predictor of citations was journal impact factor, which accounted for 5.2% of total variation in citations between papers. These findings suggest that the contribution of ASEAN countries as a group to mathematics research worldwide is modest in terms of research output and impact. Southeast Asia is an interesting setting for the study of science and technology in transition. With a population of around 640 million and a combined GDP of $2.5 trillion, the region is considered an economic powerhouse, with its economy being ranked seventh on the economy size in the world (UNESCO, 2015). The region is composed of 10 nations (Singapore, Thailand, Malaysia, Indonesia, Vietnam, Laos, Cambodia, The Philippines, Myanmar, and Brunei) that formed the Association of Southeast Asian Nations (ASEAN), where the economic development is highly heterogeneous in terms of stages of development. While Singapore and Brunei are at an advanced stage of development, Cambodia, Laos and Myanmar are still in an early stage of economic growth. Malaysia and Thailand are at an early stage of industrialization, and the rest (Vietnam, Indonesia, and the Philippines) are considered developing economies. In recent years, all ASEAN nations have recorded a strong and steady economic growth (British Council, 2015). The dynamic growth of economy has helped the development in science and technology in the region which is now considered a research and innovation hub in the world (Thomson Reuters, 2016). In parallel with the economic growth, scientific research in ASEAN countries has also undergone remarkable changes during the past two decades. A recent analysis found that ASEAN share of the world’s scientific literature has almost doubled from 1.37% in 2006 to 2.43% in 2015 (Thomson Reuters, 2016). Moreover, patenting activity from ASEAN has also increased more than 40% during the past 3 years (Thomson Reuters, 2016). At the country level, the scientific productivity appears to be correlated with the knowledge economy index (Nguyen and Pham, 2011; Rodriguez and Soeparwata, 2012). Indeed, based on the relationship between scientific output and knowledge economy index, the ASEAN countries could be grouped into four broad groups, with Singapore being the first group; Thailand and Malaysia in the second group; Vietnam, Indonesia, and the Philippines in the third group; and Cambodia, Laos, Myanmar, and Brunei in the fourth group. Scientometric analysis showed that Singapore and Malaysia had a strong research activities in Engineering and Energy; Thailand and Indonesia had high activities in Agricultural and Biomedical Sciences; Vietnam documented high activities in Mathematics, Computer Sciences and Biomedical Sciences; and the Philippines displayed a strong research trend in Environmental Sciences and Agricultural Sciences (British Council, 2015). However, a large proportion of scientific publications from ASEAN countries are resulted from international collaboration, with small output countries (e.g., Vietnam, Laos, Cambodia, Indonesia) having higher share of international collaboration than larger output countries (Haustein et al., 2011). Among scientific endeavors, the interaction between mathematical science and experimental science as a whole has contributed to economic growth and national competitiveness. In Australia, it has been estimated that the mathematical and physical sciences had contributed to 11% of the country’s economy (which is about $145 billion per year). Moreover, the application of mathematical and physical sciences brought about an additional 11% of total flow-on benefits to the economy (Australian Academy of Science, 2015). However, research on mathematics research in ASEAN has not been well documented. In a previous analysis, we found that publications resulting from mathematics research accounted for 4% of total ASEAN’s scientific output, but the proportion was widely varied between countries (Nguyen and Pham, 2011). It is also not clear to what extent mathematics research and its impact in ASEAN countries have changed over the past decades when scientific research in the region has undergone substantial changes. Therefore, in this study we aimed to map the contributions of ASEAN countries to mathematics research internationally by analyzing the published literature. Our goal is to document the trend and impact of mathematics research from ASEAN countries, and the data from this analysis will provide an insight into to the transition of scientific research and its interaction with mathematics in the context of the developed as well as developing world. The data used in this study were abstracted from the Web of Science (WoS) database. The database included datasets from the SCI and SCIExpanded databases within the Clarivate Analytics system. The databases encompass approximately 12,000 journals, covering all fields of scientific research. We selected the WoS database because it includes the most elite and highly cited referred journals. The WoS is also used by most governmental agencies to evaluate research productivity and quality of a nation. The analysis covered the 10-year period of 2006–2015. We created a bibliometric dataset that included all the papers published by Clarivate Analytics-indexed journals during the period of January 1, 2006 to December 31, 2015. The selector "CU" in the WoS database was used to select the 10 ASEAN countries: “BRUNEI,” “CAMBODIA,” “INDONESIA,” “LAOS,” “MALAYSIA,” “MYANMAR,” “PHILIPPINES,” “SINGAPORE,” “THAILAND,” or “VIETNAM.” In this analysis, the articles were selected by using the following two inclusion criteria: (a) original contributions; and (b) the languages were English and non-English. The following exclusion criteria were applied: conference abstracts, editorials, conference proceedings, reviews, and other non-journal publications. The extracted data were further filtered by the WoS Area of research that is related to mathematics. The specific areas were “Mathematics,” “Mathematics, Applied,” “Mathematical Computational Biology,” “Physics Mathematical,” and “Mathematics Interdisciplinary Applications.” The resulting dataset included, among others, the following fields: full name of all authors, institutional affiliation associated with each author, name of journal, and the number of citations up to December 31, 2015. Based on the country of affiliation, we classified an article into one of the following groups: single authored papers; national collaboration, if the paper had more than one author, and all affiliations were within an ASEAN country; and international collaboration, if the paper had at least one author whose affiliation was overseas. The rate of growth in mathematics research output was assessed by the simple linear regression model. In this model, the logarithmic transformed number of publications was modeled as a linear function of time. In this formulation, the exponent of regression slope can be considered an estimate of the rate of change. In addition, we quantify the degree of diversity in mathematics research by the Simpson index. Let the proportion of papers for a sub-area of mathematics be pi (i = 1, 2, 3, …, k), the Simpson index is defined as I=1/∑i=2kpi2. Thus, higher values of I is an indication of greater diversity of research. For the assessment of scientific impact, we obtained the 2014 journal impact factor (IF) for each paper, and based on the IF we calculated the relative citation index (RCI) which is defined as the ratio of average citation for a country over the world’s average citation. We used the multiple linear regression model to evaluate the contribution of individual factors to the variation in citation rates between papers. Because the distribution of citation rates was skewed (i.e., non-normally distributed) we applied the logarithmic transformation to the data prior to the analysis. 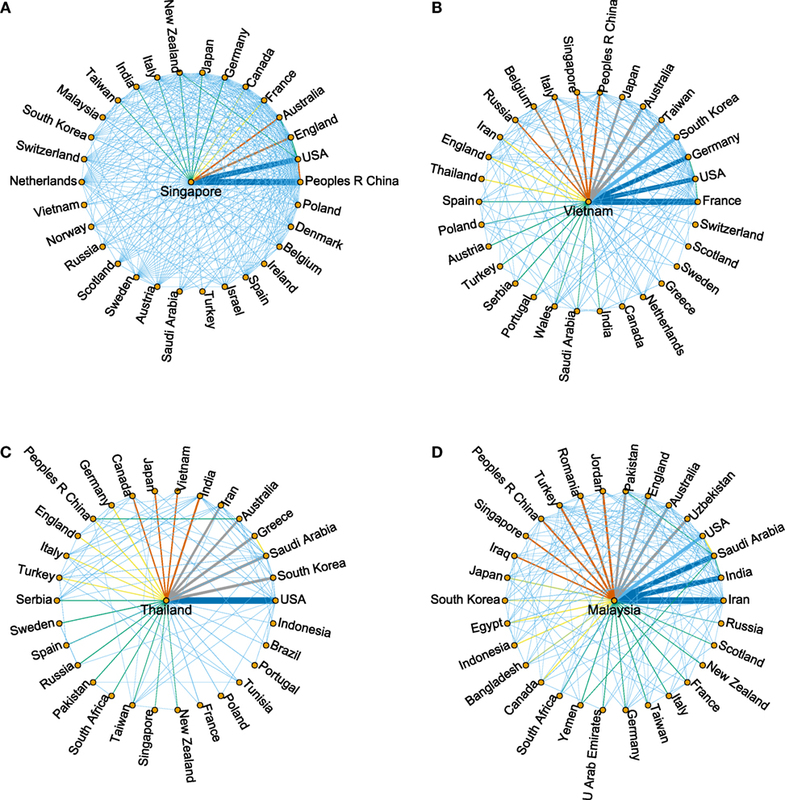 We used network analysis to construct a network of research collaboration between countries in the world. In the network analysis, the weighted connection between any two countries was determined by the number of articles that the two countries shared. All data analyses were conducted using the R Statistical Environment version 3.13 (R Foundation for Statistical Computing, Vienna, Austria) on the Window platform. The network graph was constructed using the “igraph” package. Between 2006 and 2015, ASEAN countries have published 9,890 papers in mathematics, which accounted for 3.8% of total scientific output during the same period. Although the selection criteria were all languages, all filtered papers were written in English. However, the proportion of mathematical papers varied widely among the countries, with the highest proportion being observed in Vietnam (~13% of total scientific papers), followed by Singapore (4.2%), Malaysia (~3%), and Thailand, Indonesia, and the Philippines (each ~2%). Approximately 95% of all mathematical publications were originated from just four countries, namely, Singapore (4,107 papers), Vietnam (2,046), Malaysia (1,927), and Thailand (1,317). We found no mathematical publications from Cambodia during the coverage period (Table 1). Table 1. Scientific output of mathematics research from ASEAN countries: the number of original articles published in Clarivate Analytics indexed journals (2006–2015). In general, there was a substantially growing trend in mathematics research output from ASEAN. Over the period of 2006–2015, the overall rate of growth was ~11% per annum for all ASEAN countries combined. The highest growth was recorded in Malaysia with a 23% p.a. growth rate, followed by Indonesia (18% p.a. ), Thailand (17% p.a. ), and Vietnam (16% p.a.) Although Singapore had the highest publication output, the rate of growth was only 2.8% p.a. over the coverage period (Figure 1). Figure 1. Trend of mathematics research output from Association of Southeast Asian Nations countries 2006–2016. Mathematics research in ASEAN countries could be classified into 45 subareas. However, the top 10 research areas are shown in Table 2. As expected, most publications were classified as “mathematics,” but applied mathematics publications also accounted for a substantial proportion. Singapore had the most diverse research areas in mathematics, with the index of diversity being 5.77, followed by Malaysia (2.57). Mathematics research in Thailand and Vietnam was highly concentrated in mathematics and few areas, with the index of diversity ranging from 1.4 (Thailand) to 1.76 (Vietnam). Table 2. Selected areas of mathematical research in ASEAN countries: number of publications and percent of total. Approximately 54% of all mathematical publications from ASEAN countries had at least one non-ASEAN author (i.e., international collaboration). However, the proportion of international collaboration varied greatly among countries, with Singapore having the highest proportion (66%), followed by Brunei (59%), Malaysia (55%), Indonesia (53%), the Philippines (43%), Vietnam (42%), and Thailand (38%). Figure 2 shows the mathematics research collaboration between Singapore (Figure 2A), Vietnam (Figure 2B), Thailand (Figure 2C), Malaysia (Figure 2D), and top 30 collaborative countries. The United States was the single major research partner in almost all ASEAN countries, notably with Singapore, Thailand, Malaysia, and to a smaller extend, Vietnam. Apart from the United States, France, Germany and Korea (for Vietnam); Iran, India, Saudi Arabia (for Malaysia), and China (for Singapore). Figure 2. Network of collaborations: (A) Singapore, (B) Malaysia, (C) Thailand, and (D) Vietnam. The network graph shows the mathematics research collaboration between Singapore [panel (A)], Vietnam [panel (B)], Thailand [panel (C)], Malaysia [panel (D)], and top 30 collaborative countries. Each line connecting countries represents the shared authorship between two countries, and the line thickness reflects the strength of collaboration. For the assessment of research impact, we analyzed the citation statistics accumulated between 2006 and 2015 for all the papers that had been published between 2006 and 2015. The rate of citation per year was calculated for each paper, and aggregated results are shown in Table 3. Overall, mathematics research papers from Singapore had the highest yearly citation rate, with average annual citation being 1.83. The average annual citation rate of papers from Malaysia and Vietnam were ~1.17 and 1.09, respectively. Table 3. 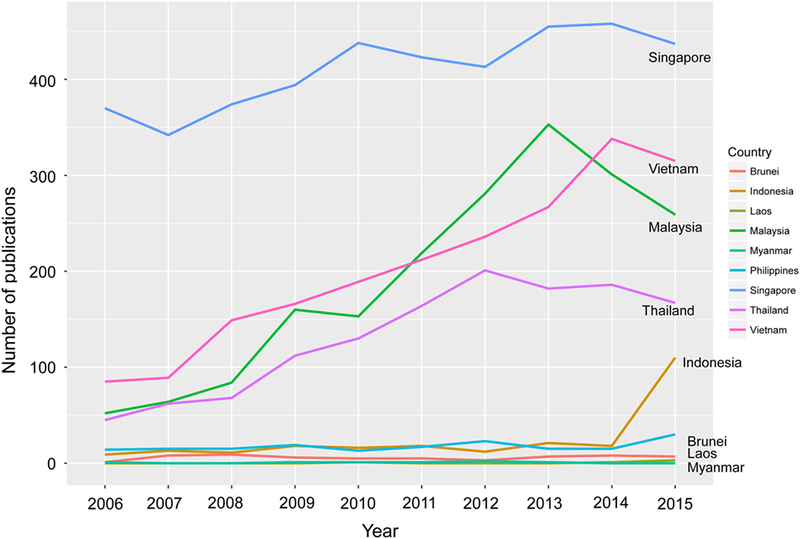 Yearly rate of citations to mathematical papers from ASEAN countries published in Clarivate Analytics indexed journals 2006–2015. In a further analysis, we selected the papers that had been published in journals with IFs in the top 10% (which was equivalent to IF > 2.395) and top 10% citations (which was equivalent to 3.5 citations or higher per year). Over the period of 2006–2015, approximately 7% (n = 717) mathematics papers from ASEAN countries were published in top 10% journals. 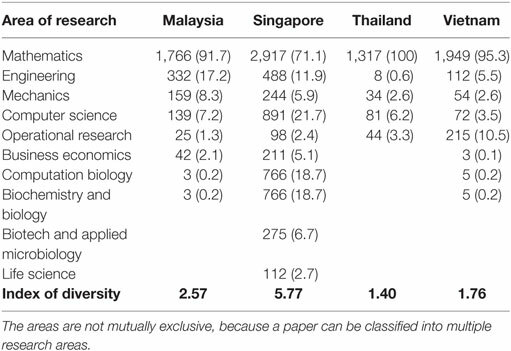 Singapore had the highest proportion of papers (~15%, n = 611) in top journals, seven-fold higher than the proportion in Vietnam (2.6%, n = 53) and Malaysia (2.4%, n = 47). Moreover, the proportion of top 10% cited mathematics papers was ~10% (n = 995) for the entire ASEAN countries. However, Singapore had the highest proportion (13.7%, n = 560), which was more than 1.5-fold higher than Malaysia (8.4%), Thailand (7.5%) or Vietnam (7.6%). Figure 3 shows the distribution of journal IFs (in the form of boxplot) stratified by pure vs. applied mathematics and international collaboration status. In either pure or applied mathematical field, papers with international collaboration were published in journals with higher IF. This trend was present in almost all countries. Figure 3. Boxplot of journal impact factors stratified by collaborative status and by country for pure mathematics (left panel) and applied mathematics (right panel). The figure in each box refers to the number of papers for each category. In a further analysis, we determined the rate of annual citations for each paper published between 2006 and 2015, and then used the multiple linear regression analysis to determine the importance of each predictor of citation rates (Table 4). The factors considered in the model was research area, international collaboration status, number of collaborative countries, and journal IF. 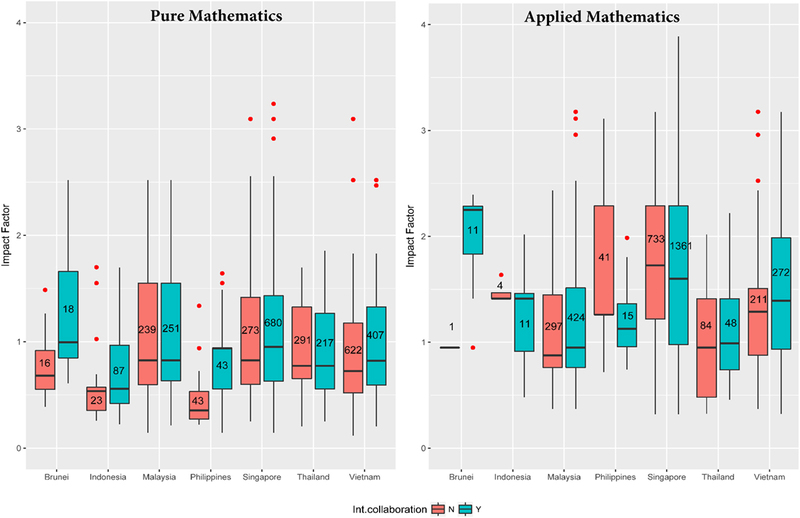 Although in univariate analysis, applied mathematics papers received on average more citation than pure mathematics papers, after adjusting for the covariates the difference in citation rates between the two areas of research was not statistically significant (P = 0.691). After accounting for the collaborative status and IF, papers with international collaboration received a significantly higher rate of citation (P = 0.003) than those papers without international collaboration. The most important factor that explained a large variation in the rates of citation was journal IF (P < 0.001). Indeed, journal IF alone accounted for 5.2% of total variance in yearly citation rates. Table 4. Predictors of citation rates: results of multiple linear regression analysis. The contribution of ASEAN countries to mathematics research worldwide has not been documented. By using a scientometric approach, we have shown that the magnitude of contribution (in terms of the number of publications) of ASEAN countries to the international literature of mathematics research is modest, but there has been a rapid growth (~11% per annum) in the publication output. Moreover, we found that just over half of the mathematical publications during the past 15 years were resulted from international collaborations. These findings deserve further elaboration. Although ASEAN is a group of 10 nations, most (95%) mathematics research has been concentrated on just four countries: Singapore, Vietnam, Malaysia, and Thailand. Indonesia and the Philippines have some mathematics research, but their publication output has been modest compared with the four countries. While the publication output in mathematics is generally proportional to the overall scientific output (i.e., countries with greater scientific activities have greater mathematics research), the proportion of mathematics publication varied remarkably between countries. In Vietnam, almost 13% of all publications were in mathematics research, but in more economically advanced countries such as Singapore and Malaysia, this proportion was between 2 and 4%. Moreover, the degree of diversity in mathematics research in Singapore and Malaysia was also higher than that in Vietnam. This is true because most (95%) of mathematics research in Vietnam was on pure mathematics, whereas a substantial mathematics research activities in Singapore and Malaysia was on engineering, mechanics and computer science. These differences seem to suggest that applied mathematics research better correlates with engineering developments in more economically advanced countries than in less developed countries. Like all other research disciplines, mathematics research is also a highly collaborative discipline. In this study, we used the coauthorship and affiliation of authors to quantify the degree of collaboration. We found that 54% of all mathematics papers from ASEAN had at least one non-ASEAN coauthor, and this proportion was highest in Singapore (66%). It is interesting to observe that the pattern of collaboration varied remarkably between countries. While the United States is the major research partner of Singapore and Thailand, it has less collaboration with Vietnam and Malaysia. The major partners of Vietnam’s mathematics research were France, Germany, and South Korea. Furthermore, most collaborative research in mathematics in Malaysia was with colleagues in India and the Middle East (e.g., Iran and Saudi Arabia). These patterns of collaboration seem to correlate with the cultural and historical connection between the host and collaborative countries. It is difficult to assess the quality of mathematics research from ASEAN countries. In this study, we focused on the yearly citation rate which is commonly viewed as a surrogate measure of the visibility or scientific impact of a paper (Merton, 1957; Bornmann and Daniel, 2008). We found that on average the citation rate of mathematics papers from ASEAN was ~60% higher than the world average. However, this high RCI was mainly driven by research from Singapore and Malaysia, which recorded the RCI of 2.46 and 1.18, respectively. The average citation rate per year of mathematics papers from Vietnam, Thailand, Indonesia, and the Philippines was all below the world average by between 8 and 30%. This is somewhat consistent with the analysis based on the top 10% citation statistics. 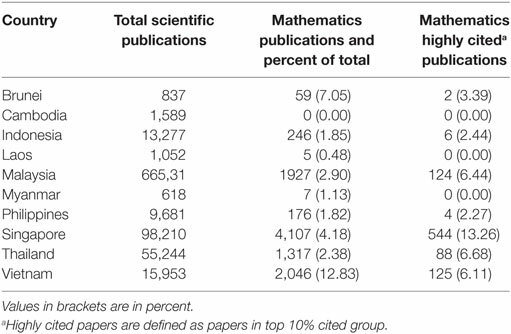 About 14% of mathematics papers from Singapore were in the top 10% citation, and this proportion was 1.5-fold higher than those from Thailand, Vietnam, and Malaysia. Taken together, mathematics research from Singapore had the highest scientific impact compared with all other ASEAN countries. What factors were associated with the variability citation rates? All factors we considered—field of research, international collaboration, number of collaborative countries, and journal IF—explained only 7% of the variation in citation rates between mathematics papers. Among the factors, journal IF was the most important predictor, accounting 5% of the variation in citation rates of mathematics papers from ASEAN countries. As expected, papers published in journals with higher IF tended to attract a greater citation rate than papers published in low IF journals. Although there were exceptions at the individual paper level, the positive correlation between journal IFs and citation rates was observed in all countries and all sub-areas of research. These data consistently suggest that despite well-known deficiencies (Seglen, 1997), journal IF is still a reasonable measure of scientific impact of mathematics papers, because it is correlated well with expert views (Korevaar and Moed, 1996). We found that papers with international coauthorship had higher citation rates than purely domestic papers. This trend was also observed in our previous studies (Nguyen and Pham, 2011; Nguyen et al., 2017) and others (Kim, 2005; Low et al., 2014). The positive effect of international collaboration on the citation rate was likely due to IF. Indeed, our analysis showed that internationally collaborative papers tended to be published in journals with high IF, and as a result, attracted more citations than non-international collaboration papers. However, we also noted that among internationally coauthored papers, those with overseas (non-ASEAN) correspondence authorship also attracted more citation than those with local correspondence authorship. The present findings must be considered within context of strengths and potential weaknesses. The analysis of publications was conducted on individual article level, which allowed a more accurate delineation of the relationship between articles’ characteristics and their impact. We used the 10-year time window for citation analysis, which was sufficient for a reliable estimate of growth and citation patterns for mathematics research (Wang, 2013). A weakness of this analysis is that the dataset did not capture papers published outside the Clarivate Analytics indexed journals (e.g., Scopus-indexed journals were not included in the WoS database). Thus, the scientific output reported here could represent an underestimate of the true output. Moreover, the analysis of affiliation could be inadequate because the WoS database sometimes ignores affiliations of non-first author (Venets, 2014). Although we could assess the research impact by citation metrics, we could neither assess research quality nor ascertain users of mathematics research from ASEAN countries. 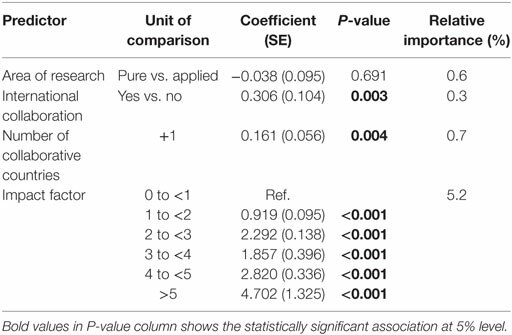 Finally, the classification of mathematical sciences into “pure” and “applied” may be biased because it was based on the primary author’s own view of grouping. In summary, we have shown that mathematics research in ASEAN countries has been mostly taken place in just four countries, namely, Singapore, Malaysia, Vietnam, and Thailand, with low level of diversity. Mathematics research in the region as a whole has, however, grown at the rate of ~11% per year over the past decade, reaching ~4% of total publications from the region. With the exception of Singapore, the impact of mathematics research originated from other ASEAN countries was below the world average. Just over half of all mathematics papers from ASEAN was resulted from international collaborations, and those internationally collaborative papers have a greater visibility than purely domestic papers. TN has full access to all of the data in the study and takes responsibility for the integrity of the data and the accuracy of the data analysis. Study conception, study design and data collection, data analysis, interpretation of results, drafting manuscript, critical reviews, and final approval of manuscript content: TH-L and TN. TN’s work is supported by the Australian National Health and Medical Research Council. The other author declares that they have no conflict of interest. Professor Tuan V. Nguyen’s work is supported by the Australian National Health and Medical Research Council. Australian Academy of Science. (2015). The Importance of Advanced Physical and Mathematical Sciences to the Australian Economy. Canberra: Australian Academy of Science. British Council. (2015). ASEAN Research Output, Growth and Impact. Singapore: Foreign Commonwealth Office. Thomson Reuters. (2016). ASEAN – The Emerging Research and Innovation Hub. Bangkok: Thomson Reuters, Report. UNESCO. (2015). UNESCO Science Report – Toward 2030. Brussels: UNESCO Publishing, 692–730. Copyright: © 2018 Ho-Le and Nguyen. This is an open-access article distributed under the terms of the Creative Commons Attribution License (CC BY). The use, distribution or reproduction in other forums is permitted, provided the original author(s) and the copyright owner are credited and that the original publication in this journal is cited, in accordance with accepted academic practice. No use, distribution or reproduction is permitted which does not comply with these terms.